From the clamshell razors and homemade lye depilatories used in colonial America to the diode lasers and prescription pharmaceuticals available today, Americans have used a staggering array of tools to remove hair deemed unsightly, unnatural, or excessive. This is true especially for women and girls; conservative estimates indicate that 99% of American women have tried hair removal, and at least 85% regularly remove hair from their faces, armpits, legs, and bikini lines on a regular basis. How and when does hair become a problem--what makes some growth "excessive"? Who or what separates the necessary from the superfluous? 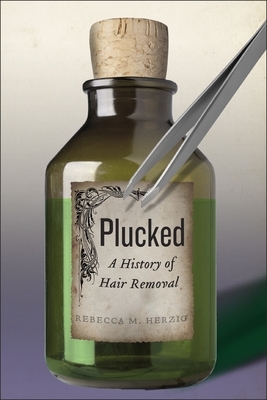 In Plucked, Rebecca Herzig shows how, over time, dominant American beliefs about visible hair changed: where once elective hair removal was considered a "mutilation" practiced primarily by "savage" men, by the turn of the twentieth century, hair-free faces and limbs were expected for women. Visible hair growth--particularly on young, white women--came to be perceived as a sign of political extremism, sexual deviance, or mental illness. By the turn of the twenty-first century, more and more Americans were waxing, threading, shaving, or lasering themselves smooth. Herzig's extraordinary account also reveals some of the collateral damages of the intensifying pursuit of hair-free skin. Moving beyond the experiences of particular patients or clients, Herzig describes the surprising histories of race, science, industry, and medicine behind today's hair-removing tools. Plucked is an unsettling, gripping, and original tale of the lengths to which Americans will go to remove hair. Rebecca M. Herzig is Christian A. Johnson Professor of Interdisciplinary Studies at Bates College. Her previous work includes Suffering for Science: Reason and Sacrifice in Modern America and, with Evelynn Hammonds, The Nature of Difference: Sciences of Race in the United States from Jefferson to Genomics.